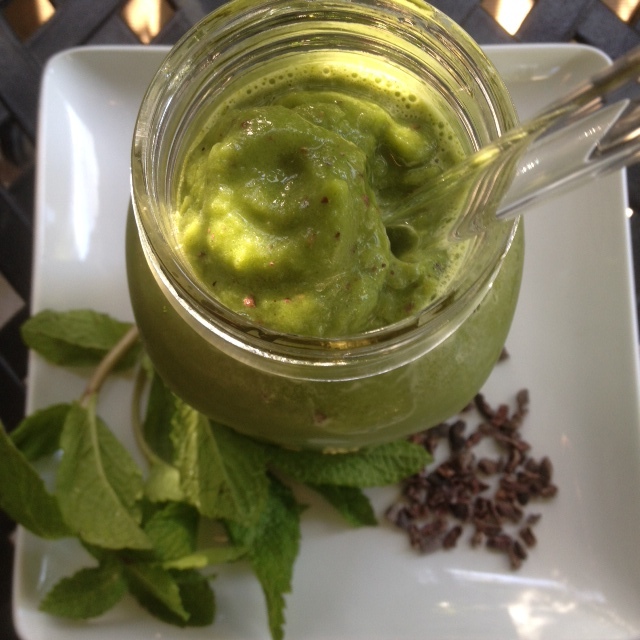 I have enjoyed so many amazing smoothie recipes on the Green Smoothie Challenge see my last post for all the details. It has my creative juices flowing and I keep having ideas for new flavors. Earlier this week I wanted a chocolate mint smoothie but I didn’t have fresh mint at the time so I used my NuNaturals peppermint stevia drops and that was very tasty. However, I still had fresh mint in the back of my mind so I picked up a bunch to experiment with. My experiment worked. This was a delightful way to start my morning. Not too minty – light and balanced. So fresh. At the very end I added in Cacao Nibs for a little bit of chocolate speckled through out the smoothie. Love it. I couldn’t decide which smoothie photo I liked best so you get both of them! Other than the fruit and liquid I don’t really measure when I make smoothies. I eye ball the greens and ice and go by how it looks. I always taste the smoothie before I pour it into my jar – that way I can add things to it if need be. After my initial taste test of this one I added in more mint and more ice. 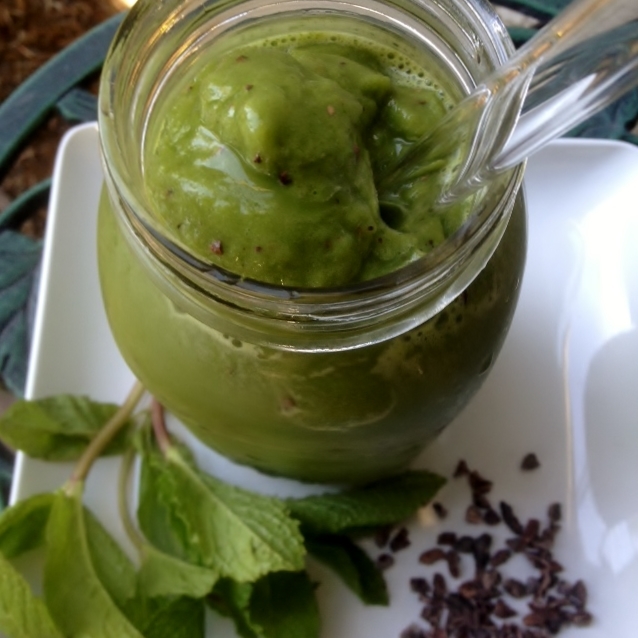 Fresh mint is very delicate in flavor so it takes quite a bit to flavor a 32 ounce smoothie! Place everything except the cacao nibs in the blender and process until smooth and creamy. Taste and add more mint leaves, sweetener and ice if desired. Add in the cacao nibs and process for just seconds to break them up enough that they will fit through the straw but not totally blend them up so you can still see little flecks of nibs through out the smoothie. Makes 32 ounces of smoothie. Notes: Next time try mini chocolate chips and add 1 Tablespoon Chia seeds or Flax seed for added nutrition. Do you like chocolate mint flavor? So enjoying your pics on IG!!! I am not really a smoothie person 0 20+++ years of it burned me out but I am sure if I ever get a blender again, I will try some! Tami, I enjoy reading your blog! Your smoothies look so creamy — what is the trick to that? I made the Chocolate Covered Blues Smoothie from the other website and it was good, but watery, not creamy. I have a Blendtec high powered blender and it really makes everything smooth. My regular blender just doesn’t produce the same results. I probably add more greens than the two cups the recipes call for – I don’t measure I just toss the greens into the blender and if you add a tablespoon of chia seeds that also thickens them up as well as more ice. I like mine to be really thick. If you use all frozen fruit you get a thicker product too. Let me know if these tips help you. This sounds delicious! I have all the ingredients except for the fresh mint, so I may make this tomorrow morning (minus the fresh mint)! Chocolate mint is a great flavor combo! Oh Andrea the fresh mint makes this extra special! I do hope you’ll try it again with the mint. I had a giant green monster for breakfast this morning too – it’s been too long! But I forgot one important thing. I usually take insulin, drink half of my smoothie, then take more insulin for the second half – it takes me a good 30 minutes to drink it – I tested my blood sugar an hour and a half after I finished it, and my blood sugar was 366! WOW that was quite the jump in your blood sugar Biz! Bananas have a very high glycemic index and 1/2 a banana is considered a serving. If you are diabetic best to choose lower glycemic fruits such as berries, and even then only in 1 serving amounts. This is why smoothies are controversial – yes fruits have nutrients but also high sugar content. 2 large bananas in one drink is not reasonable for most people. Sorry to rain on the smoothie parade, I’m a nurse health educator. This isn’t something I would have all the time – but once in a while I think is perfectly fine – I don’t have diabetes or any problems with my blood gluclose. Thank your for sharing your thoughts – it’s a good reminder for everyone!